Tuesday, Mar. 26, 2019, 7 – 8 p.m.
Join us for an evening of an insightful examination of the media landscape and its impact on African American women. Using the experiences of Michelle Obama, Oprah Winfrey and television producer Shonda Rhimes, media scholar Ralina L. Joseph explores in “Postracial Resistance: Black Women, Media and the Uses of Strategic Ambiguity,” the lives of women whose professions are intricately tied to the production and dissemination of their image and an identity that finds itself, consistently, under attack and/or effusively celebrated. Pinpointing societal responses and behaviors that careen from public acceptance to public outcry, Joseph examines the role, public personalities in a media saturated society play and how prominent African American women negotiate an uncertain terrain through their response to overt and subtle forms of hostility. While the notion that the Obama presidency heralded a postracial society has been, largely, decried, debates continue around the intractable issue of racism and sexism. The idea that the nation, in the Obama era, moved past its historic underpinnings is debunked as Joseph provides insight and historical perspective to the preponderance of racial animosity celebrated women face no matter their prominence. See-sawing between adulation and outright attack, the response of black women to societal power dynamics is, according to Joseph, an act of “performing postracialism” through the use of “strategic ambiguity.” By developing skills that side-step the image of the angry black woman, they have become effective at code-switching, strategically using silence and other oppositional tools of resistance. How is this “resistance strategy” observed and experienced by those peering up at a stage or into a screen? In the second part of the book Joseph turns her attention to the perceptions of private citizens and their opinions of the choices made by media figures as well as their own personal experiences. The findings in “Postracial Resistance” speak to the African American experience as well as broader societal circumstances in which an individual is the one or only person in the uncomfortable position of shouldering the responsibility of representing their race, gender or sexual orientation. Ralina L. Joseph, associate professor of Communication at the University of Washington, is the founding director of the Center for Communication, Difference, and Equity. Ralina is an expert on the communication of difference, or, more specifically, of how race, gender, class, and sexuality intersect with equity in our interpersonal and mediated worlds. 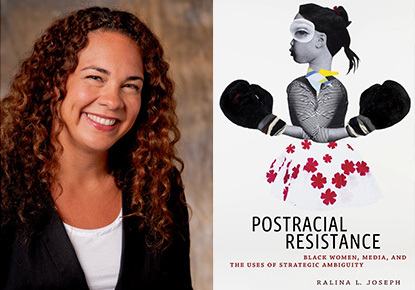 Ralina’s first book, Transcending Blackness: From the New Millennium Mulatta to the Exceptional Multiracial(Duke University Press, 2013), critiques anti-Black racism in mixed-race African American representations in the decade leading up to Obama’s 2008 election. Her second book, Postracial Resistance: Black Women, Media, and the Uses of Strategic Ambiguity, examines Black women’s negotiation of the ostensibly "after" moment of racism and sexism (NYU Press, 2018). She is currently writing two books, Generation Mixed Goes to School (with Allison Briscoe-Smith, under contract with TC Press), and Interrupting Privilege: A Field Guide (with Naheed G. Aaftaab).